By saltydecimator, March 27, 2018 in General Discussion - Any topic is welcome here!!! still no?! this our holy grail no?!!?? I am sure someone will either make a tower or mod a receiver to work with it, sooner or later. If they are smart it will not see the light of day until the patent expires unless they find a way to buy rights to use the design or part of the design. It could have already been done for all we know. I can see the Promag threads coming, lol. I think this time it would be a fun somewhat easy very non expensive project. Perhaps something to get the grand kids interested in. But they all went home. Too much wild fire smoke here. A 15 round double stack on a Saiga would be cool. On my Trench 12 firearm better. Have held both shotgun and magazine and discussed with our gun shop owner. Mossberg mag. Saiga lower. Many differences but that is not to be said it could not be done. Consider it something to save mankind from the Zombies and you are bound to succeed. Yep ... like already said, what would be easier and better? A double stack 15 on a Saiga or Trench 12 or just find some good 20 rd drums that always work. Because Mossberg is going to make their own semi auto that takes those magazines, so why bother hacking up an irreplaceable Saiga? I'm okay with that, so long as it is designed to be a simple shotgun with a compact action. i.e. not a long pump action with the usual clockwork pinball machine inside. There is no good reason for why a shotgun should have any more moving parts than a military carbine. Nor should it be more complex. Someone has done it, lol. I’ve never tried to fire it but it cycles manually. I don’t think it’s a very practical mod though. Don’t worry guys! 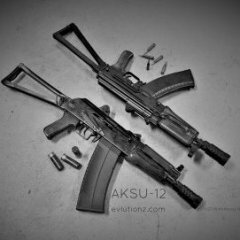 A double stack for the Saiga-12 is back on the table. It’s happening one way or another. I’d prefer to just license it out but I’m not going to wait much longer before I do it personally. If someone hasn’t snatched before I have the capital myself it will be me... I’d really like to move on to other things. I have a patent in the work that will rewrite the story of drums and a patent in the works that will make the recoil system of the AK-107 scamper home... Honestly I’m most excited about the recoil system because it can work with basically any rifle, shotgun, carbine, subgun or beltfed. It doesn’t take away short barrel options either like the 107 does. I suspect it will be the new standard in what people expect from a long gun. I also have another patent in the works for a different way to do a double stack shotgun mag! In my opinion an even better way! So much for impossible, lol! I figured you already had, lol. You are an evil genius, and I like that! I don’t see it lasting under the recoil of actually firing it. I hope no one takes this as a good to go because it would likely be an expensive disappointment. I couldn’t resist making one though, lol. None taken. I don't like paying gunsmiths either. There's a few things which I would pay them to do for me, most of which involve tools I don't have, or trial and error I can't afford the error on. Some things I could do, but just aren't exciting enough to offset the time and tool expense vs having someone else do it. Skilled work is skilled work, and there are diminishing returns in trying to be master level skilled at everything for yourself. I hope this picture doesn't constitute evidence of a breach of your agreement with mossberg, Mike. I'd hate to have you get burned on something like that. If you are worried about recoil, why not tack on a reinforcement plat in the critical areas? Did you have to cut a lot of meat out of the mag itself? For him to protect his patentability, he would need (not want. Need) a written NDA. Prior disclosure can be an absolute bar to patent. Mike needs a standard NDA form based on the work he does. It's also a good tool to keep excited inventors thinking straight about what to do and not do while fundraising, etc. Think of it as cheap preventative-medicine lawyering, rather than the expensive cleaning up a cancerous mess after it is probably too late kind. But what Mike D. has to do to protect himself and his patents, is a completely different thing from what Joe Random Gunsmith like Evl would have to concern himself with, when combining commercially available parts. About the only thing Mossberg could really do to keep people from using their products in a way they don't approve of is to not sell them to anyone in the first place. With Mike they have an agreement that spells out exactly each party's obligations, so it's apples vs. oranges. Modifying the existing mag wouldnt be patent infringement. Someone couldn’t swap out the tower though for another. They would have to use the tower as is or modified and use the existing tower. If the "magic" happens in the tower, that makes sense.